A wrenching scene of shipwrecked men helpless in the grips of the ocean, Théodore Géricault's The Raft of the Medusa is heralded as one of the most influential works of French Romanticism. But the story behind this 1819 painting is far richer and more tragic than you might imagine. 1. Its muse is not myth but history. The Medusa (or Méduse) was a French naval frigate that boasted 40 guns and fought in the Napoleonic Wars of the early 19th century. Remarkably, the ship survived these maritime battles only to crash on a sandbank in 1816 during an attempt to colonize Senegal. A shortage of lifeboats sent sailors scrambling to build a raft. Only 10 of approximately 150 people who boarded the raft lived through this catastrophe. Shortly thereafter, Géricault drew his inspiration from the accounts of two survivors. 2. Géricault did exhaustive research before laying brush to canvas. 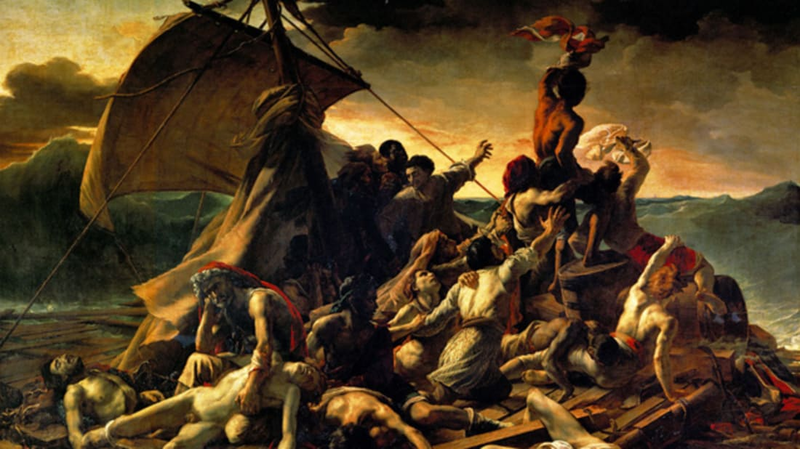 Obsessed with this tragic tale, Géricault not only interviewed and sketched the Medusa crewmates, but also read everything he could find about the harrowing event. He even attended the indictment trial of the ship's captain, Viscount Hugues Duroy de Chaumareys. Dozens of sketches followed. Géricault experimented with various models and wax figures, studied drowned cadavers at the morgue, and carefully planned how to fill the massive canvas he'd prepared for his masterpiece. 3. It's bigger than you'd expect. The Raft of the Medusa measures roughly 16 feet by 23.5 feet, making it almost as large as life—the raft itself was 23 feet by 66 feet. 4. Géricault even had the raft reconstructed. The carpenter Chaumareys tasked with transforming the doomed Medusa into a raft was employed by the painter to build a true-to-life model in his studio. From there, Géricault used the raft as an eerie model. 5. The Raft of the Medusa depicts the latter part of a 13-day journey. There were approximately 150 seamen on the Medusa, and they died quickly and gruesomely. The first night, 20 expired from suicide, fighting, and being washed overboard. By day four, only 67 remained. To staunch their starvation, they turned to cannibalism. On the eighth day, things went from really bad to brutal as the hardier survivors pitched overboard the weak and wounded, still alive but helpless to save themselves. By July 17, 1816, only 15 men remained when a ship called Argus happened upon them, rescuing this surviving 10 percent; five died soon afterward. 6. A sign of hope lies on The Raft of the Medusa's horizon. The men toward the painting's right side flail to snare the attention of a potential rescue boat so far in the distance it's easy to miss. Some scholars read this element as representing the vanity of hope, since there's no way such a distant ship could see their distress signal, while others suggest this wee ship to be Argus, on the verge of rescuing these sailors from the brink of death. 7. Technically, The Raft of the Medusa is not a history painting. The grand scale of the canvas, the treatment of the subjects, and the fact that it's capturing a true story makes The Raft of the Medusa seem an awful lot like it would be categorized as historical. However, as the piece was completed just three years after the event it depicts, it was too contemporary a capturing to be designated as such. 8. Géricault drew inspiration from Caravaggio. Art historians regard the French Romantic's employment of chiaroscuro on the bodies in The Raft of the Medusa as distinctively reminiscent of the 16th century Italian painter's religious pieces, like The Entombment of Christ. Another nod to Caravaggio is found in the heroic poses struck by Géricault's desperate subjects, whose bodies are noticeably less emaciated than would be true to life. 9. Its blend of authentic and heightened elements makes it a landmark in French Romanticism. Géricault's diligent research acquainted him with the truth of this horrific experience. Caravaggio's seminal influence gave him direction in how to channel the emotion, resilience, and inescapability of mortality he sought to portray. "There's this strange mixture that we often see in Romanticism," Dr. Beth Harris explains. "This is a kind of Proto-Romantic painting of mixtures of the real and the unreal." 10. The Raft of the Medusa's staging is meant to draw you in. Through the aforementioned sketches, art historians have been able to track Géricault's decision making in this ambitious painting's composition. One major change from the sketches to the final canvas is where the raft is positioned in the frame. An early sketch shows the raft higher up, while The Raft of the Medusa has the barely afloat vessel low, in the viewer's space. It's almost like you could step right through onto that cobbled-together craft and into the shoes of its wretched crew. In this way, Géricault drives viewers to empathetic responses. 11. Early reviews were mixed. Géricault debuted the painting at Paris's Salon of 1819, where Le Journal de Paris noted, "It strikes and attracts all eyes." But the artist's depiction of these doomed men also struck a chord. Those who favored classicism sneered at what they saw as a "pile of corpses," while Géricault's contemporary, Troubador-style painter Marie-Philppe Coupin de la Couperie, declared, "Monsieur Géricault seems mistaken. The goal of painting is to speak to the soul and the eyes, not to repel." 12. Géricault feared The Raft of the Medusa was a failure. After putting so much of his time and effort into the piece, the 27-year-old artist felt the French art world had rebuffed the painting he thought would launch him. When the exhibit closed, a defeated Géricault cut the canvas from its frame, rolled The Raft of the Medusa up, and unceremoniously sent it to be stored at a friend's home, lamenting, "It's not worth looking at. I shall do better." 13. Luckily, French historians saw The Raft of the Medusa's value. After the wreck, French society was in an uproar over the royal appointment that had made Chaumareys the Medusa's captain. He was under scrutiny not only for the shipwreck, but also for his actions afterwards. When the Medusa was being abandoned, Chaumareys took to one of the few lifeboats, to which the makeshift raft was tied so the crew might survive together. But when the rickety raft seemed to threaten his vessel, the cowardly captain literally cut ties, abandoning his crew to their fates. The king came under fire for Chaumareys's appointment to captain because the viscount had not been to sea for 20 years prior. He was wildly inexperienced for the voyage. Within this context, Auguste Jal and Jules Michelet both heralded The Raft of the Medusa for its perceived political themes. In the thick of the Bourbon Restoration, the piece was seen as an indictment of the monarchy with Michelet proclaiming, "Our whole society is aboard the raft of the Medusa." 14. Géricault may have tried to downplay the piece's political critique. Though known today as The Raft of the Medusa, the painting was originally displayed under a far less provocative name: Scene of a Shipwreck. But this named fooled no one. The tragedy of the Medusa and the atrocities of its aftermath were big news just three years before. So this scene was instantly recognizable to the Salon's visitors. It's possible Géricault knew the connection would be made, but hoped the piece would be seen on its own merit instead of as an exploitation of a grim event. 15. Géricault didn’t live to see his homeland embrace The Raft of the Medusa. Upon its debut at the Louvre, The Raft of the Medusa did win a gold medal from the judging panel. However, Géricault was devastated that the institution did not request the piece for its national gallery. The following year, he found fame and fortune in London, when his exhibition of The Raft of the Medusa earned him 20,000 francs (his cut of the door) and praise as an innovator of French art. Sadly, it wasn't until after his death at age 32 that Louvre curator Louis Nicolas Philippe Auguste de Forbin pursued acquisition of The Raft of the Medusa for the museum's coveted collection. But there it has been cared for and regarded as a masterpiece for nearly 200 years.